It is hard to overstate what is at stake in the dramatic showdown between Wisconsin’s teachers and their Republican governor and legislature. The political and economic course of our country hinges on how the issue of public-sector unions is resolved, in Wisconsin and elsewhere. For the sake of our country’s political and economic future, Gov. Scott Walker and his Republican colleagues need to prevail in the current contest with the Wisconsin teachers’ union and their allies. That isn’t easy for me to say. As an educator, I have great respect for all those (and they are many) in my chosen profession who capably and even brilliantly serve our nation’s youth. The fact is, though, that the status quo is untenable. The budget crunch isn’t merely a projected crisis some 30 years in the future. Right now, several state and local governments are careening toward fiscal disaster. There are many factors, of course, but a major one is that retirement plans for public-sector workers are spectacularly underfunded, perhaps by as much as $3 trillion nationwide. Governor Walker is being cast as the ogre for proposing to avert the onrushing flood of red ink, but the blame properly belongs to his predecessors who made unaffordable and unkeepable promises. All but the most zealous ideologues will admit that you can’t spend what you don’t have, and even some Wisconsin teachers are now indicating a willingness to help balance the state’s budget by contributing more to their pension and health benefits. Politically, this battle is the ultimate partisan clash. Unions and the Democratic Party are joined at the hip. Unions collect mandatory dues from their members, then contribute massive financial and human support to the electoral campaigns of their political allies (overwhelmingly Democrats). Democrat office-holders repay these favors by granting unions generous legislated benefits, both monetary and in the form of rules that strengthen the political power of union officials. Wisconsin’s Democratic senators took the extraordinary step of fleeing the state in what appears to be a desperate ploy to preserve the flood of union money coming to them, while Republicans seem every bit as hopeful of reducing the flow of tax dollars to their political opponents. Indeed, it is the use of tax dollars to lobby for more government spending, and thus for more taxes, that is the crux of the problem. Public-sector unionism is the ultimate conflict of interest, because the necessary objective of these unions is to capture control of the very legislatures that vote on their compensation packages. I share FDR’s conviction that, in a government of the people, by the people, and for the people, those who work for the government must be servants of the people. When public-sector unions threaten to withhold their services unless the taxpayers, through their elected representatives, pay up, it creates a process of political extortion by which the majority of citizens is made subservient to the public-employee minority. This is the way things work under feudalism or socialism, but is the exact inverse of the proper order in a truly democratic republic. Some have called the Republican proposals in Wisconsin “union busting.” This is inaccurate. 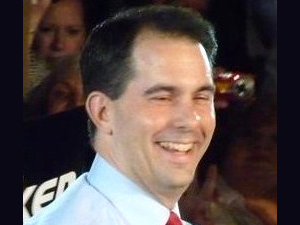 Walker is proposing to reform unions, not to abolish them. He seeks to make the payment of union dues voluntary instead of compulsory. If teachers believe that what the union leadership is doing is worthwhile, they can continue to support those activities through voluntary contributions. If, on the other hand, Republican teachers would rather not contribute to Democratic candidates, they could follow their conscience and opt out. In a democratic republic, people should be free from being coerced into supporting candidates and causes to which they are opposed. What is really at stake in the Wisconsin donnybrook is whether individual liberty or government power has the upper hand in our country. We are witnessing a battle for the soul of the republic.